Fara began performing with the Folsom Lake Symphony as a founding member in 2004. Her love of the violin began as a sixth-grader in the Dallas, Texas public school system. Although she eventually chose a corporate career-path, she knew that orchestral performance would always be an important part of her life. While earning her undergraduate degree in Psychology from Duke University, she was an active participant in their music department, serving as the Duke Symphony Orchestra Concertmaster. Fara then received her MBA from Boston College, returning to California to begin her career in Silicon Valley. 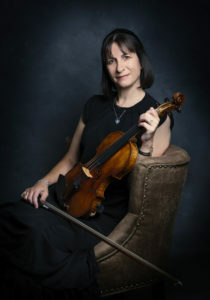 Fara has enjoyed performing as a first violinist with many community and regional orchestras throughout her life including several years as Concertmaster of Redwood Symphony and Assistant Concertmaster of Mission Chamber Orchestra in the Bay Area. When a corporate transfer brought her family to Sonoma County in 2013, she joined the Philharmonia Healdsburg and Ukiah Symphony Orchestra. Fara and her family are thrilled to have returned to the Sacramento region where she lives in Rocklin with her husband and two teenage sons.